Apple iPod Classic 160GB 7th Generation Black (The Latest Model). New Apple iPod Classic 160GB7 th Generation Black (The Latest Model) in Original Box. Manufacturer : Apple. New Accessories. New Earphones. Model A1238. Condition is used. No scratches or scuffs on the front. Model number and date introduced: A1238: 2009-09. You are looking at a pre-owned Apple iPod Classic 160 GB. It uses USB for syncing. Was used once and placed back in box, Apple iPod classic 7th Generation Silver (160 GB). Condition is Used. 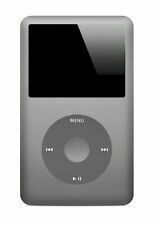 The Apple iPod classic is a portable MP3 and MP4 player in silver. The iPod has a Dock Connector and a 3.5 mm Stereo Jack. Songs can be deleted or you can load your own or add to the ones installed. Apple iPod Classic 7th Generation 160g Black Model. Condition is Used. Shipped with USPS First Class Package. Back is scratched on the back but it does work. The item in the images is the actual one you will receive. 5 out of 5 stars - Apple iPod Classic 160 GB 7th Generation MC297LL A1238 LOOK!!! 1 product rating1 product ratings - Apple iPod Classic 160 GB 7th Generation MC297LL A1238 LOOK!!! Here's a nice deal. This pre-owned black 160GB 7th Generation Apple iPod Classic is in good shape and has a new battery. It is model number MB147LL and running OS 1.0.2. I put in the battery myself. For sale! 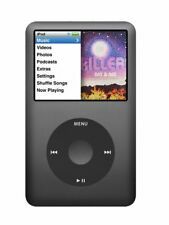 Gen 5 iPod Classic, matte black color, 80 gig hard drive, in full working order. The battery life on this unit is somewhat compromised as it has the original battery still in service. The face has some minor discoloring from use, and of course the back of the case has the fine scratching normal to apple products. Comes with one 30 pin charge/sync cable. 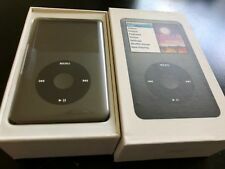 Apple iPod Classic 7th Generation Black A1238 MC297LL/A 160GB - Great condition, clean, one owner iPod barely used. Some minimal wear scratches on back due to normal use as shown in pictures. Original box and accessories without headphones. Leather protective case, armband holder and un-used screen protector included. Apple iPod Classic 7th Generation 160g Black Model. Condition is Used. Shipped with USPS First Class Package. Comes with clear protector/case (which it has always been stored in), has screen protector attached. Original cables, unused earbuds. Will include original POP. In original box! I make no guarantees about battery life; it was used for several years, and the battery will likely need to be replaced at some point. It does appear to charge fully and comes with charging cable (which will provide power in any case). Slight bend of casing at charging dock. Overall this is in great shape and has been well cared-for. Restored with new software. Apple iPod classic 7th Generation Black (160 GB) (PRE OWNED!) . Condition is Used. Shipped with USPS First Class Package. DONT COME WITH ACCESORIES . GREAT CONDITION. ipod works smooth. ill give it a B condition. Good taken care off. Put plastic on them so they dont get damaged .has use of wear on back of ipod but nothing crazy. . Barely anything. if any complain . Contact me first so we can work things out before opening a return . Anything to male the customer pleased .it is use so it might have minor scratches , dents , regular usage . Only accept returns if item isnt functional . Apple iPod Classic 160GB Model A1238 Black Factory Reset - Late 2009. Condition is Used. Shipped with USPS First Class Package. Condition is Used. Factory reset. Tested and working. Includes box, usb cable and leather case. Light scratches on the back. Small knick on the bottom right corner. The belt clip on the leather case is torn. Apple iPod Classic 160GB 7th Gen Black Transparent - Custom Refurb! New Battery! IPod is a 7th Gen Classic with a custom transparent faceplate installed. iPod has passed a high-standard comprehensive test which covers all aspects of the iPod's functionality. iPod is in excellent condition as seen in the pictures! 5 out of 5 stars - Apple iPod Classic 160GB 7th Gen Black Transparent - Custom Refurb! New Battery! 1 product rating1 product ratings - Apple iPod Classic 160GB 7th Gen Black Transparent - Custom Refurb! New Battery! 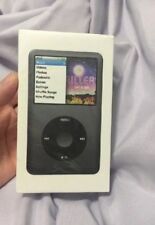 Apple iPod classic 7th Gen A1238 Aqua Black 160GB. Condition is Used. Shipped with USPS Priority Mail Small Flat Rate Box. Apple iPod classic 7th Generation Silver (160 GB). Condition is Used. Shipped with USPS First Class Package. Trending at $256.66eBay determines this price through a machine learned model of the product's sale prices within the last 90 days. Apple iPod classic 7th Generation Silver (160 GB) New in box (opened). iPod i s n earM I N T C O N D I T I O N ! F r o n t i s m i n t condition a n d r e a r h a s a f e w V E R Y T I N Y s c r a t c h e s froms i t t i n g i n b o x. Used Apple iPod Classic 7th Generation 160GB WORKS GREAT! I have reset the iPod. Black Front, Silver/Gray Back. 5 out of 5 stars - Apple iPod Classic 7th Generation 160GB Black A1238 MC297LL WORKS GREAT!!! 1 product rating1 product ratings - Apple iPod Classic 7th Generation 160GB Black A1238 MC297LL WORKS GREAT!!! Apple iPod Classic 160gb Black 7th Generation 2011 model WORKS w/ Apple ear buds. Has scratches. Includes USB charging cable and Ear buds. Apple iPod classic 7th Generation Silver (160 GB). Condition is New. Shipped with USPS First Class Package. Apple iPod Classic 7th Generation 160g Black Model REFURBISHED ! Apple iPod Classic 7th Generation 160g Black Model REFURBISHED ! . Condition is Manufacturer refurbished. Shipped with USPS First Class Package.great . Amazing condition . Works very close to smooth . Buttons feel tiny bit like its refurbished . But besides that works smooth . If any incovinience i accept returns. Or replacements . Anything to make customers happy. Doesnt come with accesories . 5 out of 5 stars - Apple iPod Classic 7th Generation 160g Black Model REFURBISHED ! 1 product rating1 product ratings - Apple iPod Classic 7th Generation 160g Black Model REFURBISHED ! NOT A CHINESE REFURBISHED iPOD! This device includes our 90. This warranty is provided by us and will cover any operational failure. Battery 850mah. You are buying a Custom iPod classic 6th generation 160gb (only). Tested works great. It is a complete iPod with No accessories. 160gb hard drive. My iPod are custom built. 5 Colors To choose from for your iPod. 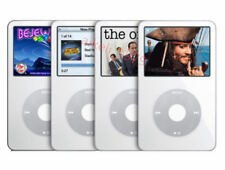 This particular model is also known as the iPod video and features 80GB of storage and can play music, videos and podcasts as well as storing photos. This is the iPod Classic 6th Generation from Apple. Apple iPod 160Gb Video 6th Generation Silver Works Great Has Lines On Screen. Condition is Used. Shipped with USPS First Class Package. Works great and battery holds a charge. Plenty of scuffs from use, 2 lines of dead pixels on the screen as shown in photos. Sold as is. What you see is what you get. Ask questions before buying. Thanks for looking and check out my other items! Comes with brand new charger(not original).You are buying a used Apple iPod A1238 Classic 7th Generation Black 160GB PC297LL. Used condition. Shows lots of scratches and some knicks but still works fine. Comes with 818 songs. Photo's are of the actual items you will receive. I try to describe things to the best of my ability, please review the pictures and if you have any questions I will be glad to answer them.Feedback is very important to me please If you have an issue with my item please don't immediately leave bad feedback, message me and I will get back with you as soon as possible and help you to the best of my ability to work out the problem.Thanks for your interest. Apple 80GB iPod Classic - 6th Generation - Silver - MB029LL . Pre-Owned / In good condition. Chicago, IL 60612. Model: A1238. This item is used and in good working order. The pictures you see are of the actual item and show any visible wear. Manufacturer: Apple. Electronics Cafe specializes in used electronics. Trending at $113.32eBay determines this price through a machine learned model of the product's sale prices within the last 90 days. You are buying a Custom iPod classic 6thgeneration 160gb (only). T ested works great. It is a complete iPod with No accessories. 160gb hard drive. My iPod are custom built. 5 Colors To choose from for your iPod. Apple iPod Classic 7th Generation 160GB - Black - FREE SHIPPING! Good Condition! IPod in overall good condition and is fully functional. Will be reset for next user. 160gb storage and black in color. iPod has typical scratches around the body from normal use. iPod only, no cables. Tested and works. A few small scratches on screen. Many small scratches on mirrored surfaces. Includes iPod only - NO ACCESSORIES OR CHARGER Color: Black Date: Late 2008 Processor Type: Samsung ARM Onboard RAM: 64 MB Storage Capacity: 160 GB Song Capacity: 30,000 Photo Capacity: 25,000 USB Support: Sync & Charge Connectivity: USB, Audio Ports: Dock, Headphone Please see photos for details. Thank you for viewing our item. Apple iPod Classic 7th Generation 160GB - Black - Great Condition - Fast ship!!! APPLE IPOD CLASSIC 160GB. BEFORE OPENING A CASE! M in or scratches workingfine. New 512gb Custom U2 iPod Classic 7th Gen Gold 3000Mah Batt, or 5 colors New Red!